Mommy Laura reads Isaac a VERY important book. This is our beautiful son Isaac. Isaac passed away at five months of age due to complications with Hypoplastic Left Heart Syndrome and CHARGE Syndrome. Among all of Isaac's favorite activities, including playing his foot piano, holding hands, nibbling on his fingers, and snuggling, Isaac's absolute favorite pastime was reading. Isaac's two favorite books were Rex Wrecks It and Pete the Cat and His Four Groovy Buttons. Isaac's Bookshelf was created in his honor and memory to help share the joy of reading with children who are in the hospital. The bookshelf rolls around the unit visiting patients. It is also serves as an exciting destination for patients who are working on improving their mobility after surgery. 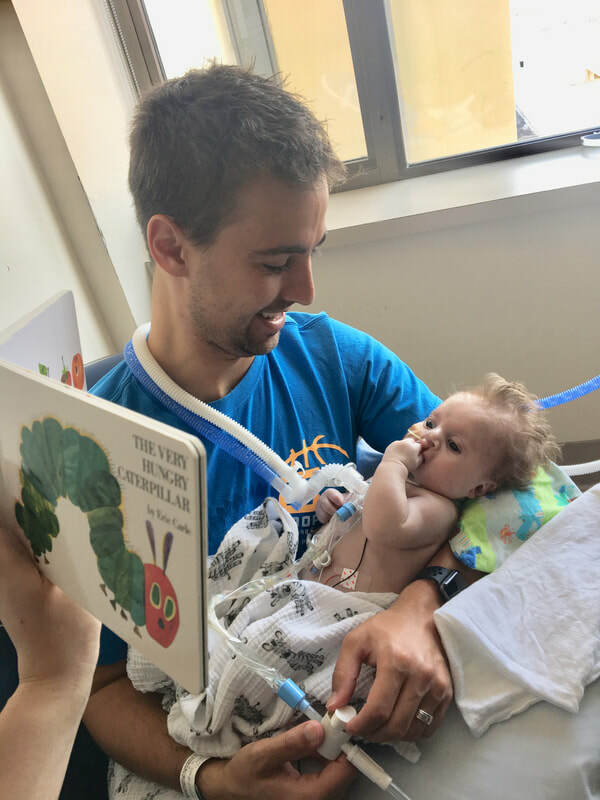 Every patient has the opportunity to pick a book from Isaac's Bookshelf to read in the hospital and then take home with them. Isaac's Bookshelf is located in the Pediatric Intensive Care Unit at Sacred Heart Medical Center in Spokane, Washington. Daddy Cody is the best reader Isaac knows.